BELL, F. V., Air Mechanic, R.A.F. He joined in 1918, and after his training was engaged on important work in connection with aero-engines. He did valuable work with his Squadron until after the Armistice. He was then drafted to India, where in 1921 he was still serving. 66, Lassell Street. Greenwich, S.E.10. BELL, G. D., Sergt., R.A.S.C. (M.T.) A serving soldier since December 1907, he proceeded to France in August 1914, and was present at the Retreat from Mons and the Battles of the Marne, the Aisne and Ypres. From December 1914 he was employed at the Base depots at Le Havre and Marseilles, and did important boiler work in the transport workshops until 1919, when he returned to England. He was still serving in 1921 in the Mechanical Transport workshops at Aldershot, and holds the Mons Star, and the General Service and Victory Medals. 59, Sportsbank Street, Catford, S.E.6. BELL, G. V. (Mrs.), Member, W.R.A.F. She joined the Women's Royal Air Force in May 1918, having previously served in it as a civilian worker, and was engaged on important duties at Greenwich No. I Stores Depot. She did duty as Storewoman and in the clerical department and carried out her responsible work with efficiency until April 1919, when she was demobilised. 11, Coldbath Street, Lewisham, S.E.13. BELL, J., Private, Royal Defence Corps. He first enlisted early in 1882, and saw much service in Egypt and India. Shortly after the outbreak of war in August 1914, he rejoined in the Royal Defence Corps and rendered valuable services in England and Ireland until his demobilisation in March 1919. He holds the Egyptian Medal (with two bars), the India General Service Medal and the Khedive's Bronze Star. 45, Bird-in-Bush Road, Peckham, S.E.15. BELL, R. J., Corporal, R.A.F. He was mobilised from the Reserve in August 1914, and was engaged in the Queen's Own (Royal West Kent) Regiment and the Labour Corps. on important duties at various stations until 1916. He was then found to be medically unfit for service abroad and was transferred to the Royal Air Force, with which he rendered valuable services until February 1919, when he was demobilised. BELL, R. T., Corporal, Royal Scots. He joined in May 1916, and on completion of his training was retained on important duties at various home stations until July 1918. He was then sent to Russia, where he rendered valuable services as a Signaller at Archangel. Eventually demobilised in June 1919, he holds the General Service and Victory Medals. 75, Barkworth Road, Rotherhithe, S.E.i6. BELL, T. R., Private, R.A.S.C. (M.T.) He volunteered in October 1914, and in the following December embarked for Egypt, where he did good work as an ambulance and transport driver. Whilst in this theatre of war he contracted fever, and after hospital treatment at Cairo, proceeded to Palestine, and served on that front in a similar capacity until after the close of hostilities. He was demobilised in March 1919, and holds the 1914-15 Star, and the General Service and Victory Medals. 114, Malliam Road, Forest Hill, S.E.23. BELL, V., Rifleman, 21st London Rgt. (Surrey Rifles). Volunteering in November 1914, he quickly proceeded to the Western Front, but after two months' service there was transferred to Egypt in March 1915. Eight months later he was sent to Salonika, but soon returned to France, and was badly wounded in action at Armentieres in October 1916. He was discharged as medically unfit for further service in February 1917, and holds the 1914-15 Star, and the General Service and Victory Medals. 1, Kneller Road, Brockley, S.E.4. BELLAMY, P., Gunner, R.F.A. 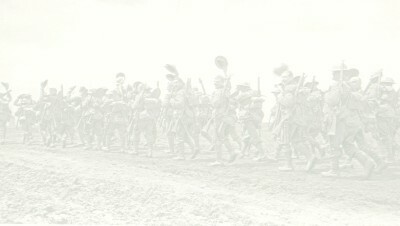 He volunteered in May 1915, and in the following March was drafted to France, where he served with his Battery in the Battle of the Somme, and at Mailly. Ypres, and Passchendaele. During his service overseas, he rendered excellent services, remaining on the Western Front until 1919. Returning home he was demobilised in March of that year, holding the General Service and Victory Medals. 66, Chilton St., Lower Road, Deptford, S.E.S. BELLARS, F. C., Driver, R.E. Volunteering in 1915, lie was sent in the following year to Egypt. In this theatre of hostilities he served on the Suez Canal, and at Cairo, and Alexandria. He later proceeded to Palestine, and was in action at Gaza, Beersheba, and Jerusalem. Demobilised on his return home in 1919, he holds the General Service and Victory Medals. 16, Reaston Street, New Cross, S.E.14. BELLEW, H., Special Constable. He volunteered for service with the Colours, but after a brief period was discharged as medically unfit for military duty. Whilst following his occupation as postman, he joined the Special Constabulary, and throughout hostilities rendered valuable services, being on duty during all-night air raids. 51, Canterbury Road, Old Kent Road, S.E.15. BELLINGER, W. C. J., Gunner, R.G.A. He volunteered in June 1915, and after a period of training was employed on various duties at home stations. Later, under orders for France, he was on his way to that theatre of hostilities, when the draft was sent back, as a naval action was in progress. He was afterwards admitted to hospital at Tilbury owing to loss of speech, and was eventually invalided out of the Service in June 1916. 10, Pitt Street, Peckham, S.E.15. BENFIELD, S. C., Driver, R.F.A. Volunteering in August 1915, he was drafted to France three months later, and served with his Battery in many important engagements, including the Battles of Ypres, the Somme, Arras, and was wounded. He remained overseas, doing excellent work, until March 1919, when he was demobilised, holding the 1914-15 Star, and the General Service and Victory Medals. BENINGFIELD, A. T., A.B. Royal Navy. He joined in May 1917, and was posted to H.M. Mystery Ship "Marna." In this vessel he served in the North Sea, and off the Irish Coast, engaged on patrol and other important duties, and was later stationed for a time at Scapa Flow. He rendered excellent services throughout, and was demobilised in January 1919, holding the General Service and Victory Medals. 28, Tranton Road, Rotherhithe, S.E.16. BENNETT, A. (Mrs.), Special War Worker. This lady volunteered for work of National importance in June 1918, and attached to the Royal Army Service Corps, served at Chelmsford, Dunmow, Shoeburyness, and other places. She was employed on hay-baling and other duties, rendering excellent service until she was demobilised in June 1919. 24, Colls Road, Peckham, S.E.15. BENNETT, A. H., Private, 13th London Regiment, and 5th Dorsetshire Regiment. He joined in March 1917, and later in the same year was drafted to Mesopotamia. There he took part in heavy fighting on the Euphrates and Tigris fronts, and was in action near Kut-el-Amara, at Baghdad and Tekrit. In October 1918, he was sent home on compassionate grounds, and served at Exeter and Weymouth, engaged on clerical duties until he was demobilised in February 1919, holding the General Service and Victory Medals. BENNETT, C. E., Private, 21st London Regiment. He volunteered in May 1915, and in the following February proceeded to the Western Front. In this theatre of war, he took part in several engagements on the Somme Front, and was wounded at Vimy Ridge in September 1916. Invalided home he spent some time in hospital at Portsmouth, and returning to France in the following March, was again in action on the Somme. In October 1917, he was wounded for the second time at High Road, and invalided to England, was sent to hospital at Southampton. He was eventually discharged in April 1918, as unfit for further service, and holds the General Service and Victory Medals. 15, Triangle, Ruby Street, Peckham, S.E.15. BENNETT, E. J., Sapper, R.E. He volunteered in December 1914, and in July of the following year crossed to France, and served in many sectors. He did valuable work laying mines and fixing wire entanglements, and was present during the fighting on the Somme, and Arnie, and Ypres. On one occasion he was wounded, but after receiving treatment was able to rejoin his unit. Demobilised in January 1919, he holds the 1914-15 Star, and the General Service and Victory Medals. 38, Willow Walk, Catford, S.E.6. BENNETT, F. G., Rifleman, 21st London Regt., and Private, 1st Surrey Rifles. He joined in May 1916, and two months later crossed to France, where he saw much heavy fighting in the Somme sector. In May 1917, he was wounded and invalided home, and after receiving hospital treatment was discharged as medically unfit in January 1918. He holds the General Service and Victory Medals. 8, Berthon Street, Deptford, S.E.5. BENNETT, G. F., Private, 1/20th London Regiment. Mobilised with the Territorial Forces in August 1914, he was drafted to France in the following March. There he participated in several important engagements including the Battle of Loos, and was wounded. He was invalided home, admitted to hospital at Shorncliffe, and after receiving treatment was discharged in September 1916 as unfit for further military service. He holds the 1914-15 Star, and the General Service and Victory Medals. 8, Plumbridge Street, Greenwich, S.E.10.